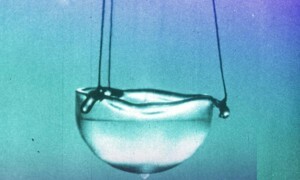 Better still, scientists have recently discovered that the law controlling entanglement between different parts of a helium superfluid is the same as that governing the exotic behavior of black holes in outer space. In the 1970s, Stephen Hawking and Jacob Bekenstein discovered something strange about black holes. They calculated that when matter falls into a black hole, the amount of information the black hole gobbles up—what scientists call its entropy—increases in proportion to the black hole’s surface area, not its volume. This would be like measuring how many files will fit in a filing cabinet based on the area of the drawer’s walls rather than how much space is inside the drawer. As with many aspects of modern physics, check your common sense at the door. 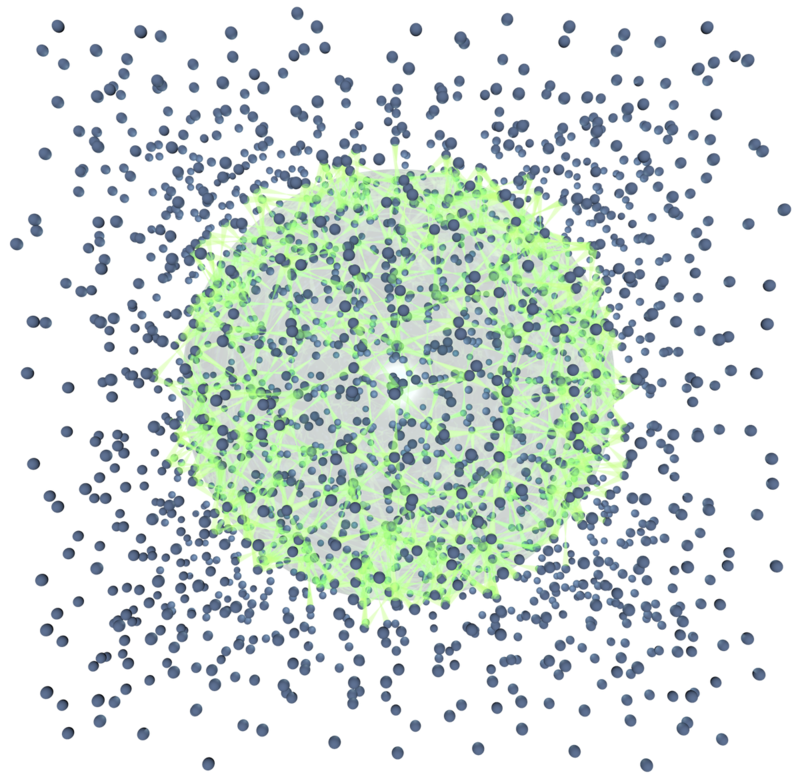 By using a supercomputer to simulate a container of superfluid helium atoms at absolute zero temperature, our team of scientists has discovered that the amount of quantum entangled information shared between two parts of the container grows with the area of the boundary between them (Fig. 2). Just like a black hole, it seems that the information needed to describe a three-dimensional volume of space is entirely encoded on its two-dimensional surface. These new results demonstrate for the first time the existence of an entanglement area law in a real quantum liquid that can be studied in a laboratory on earth, and then applied to improve our understanding of black holes in space. This finding could ultimately deepen our understanding of the holographic principle—the idea that, like a holograph, our apparently three-dimensional universe can be fully described in only two dimensions. 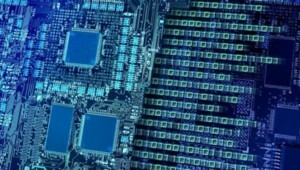 It could also lead to using superfluid helium as an entanglement resource, or fuel for a quantum computer. 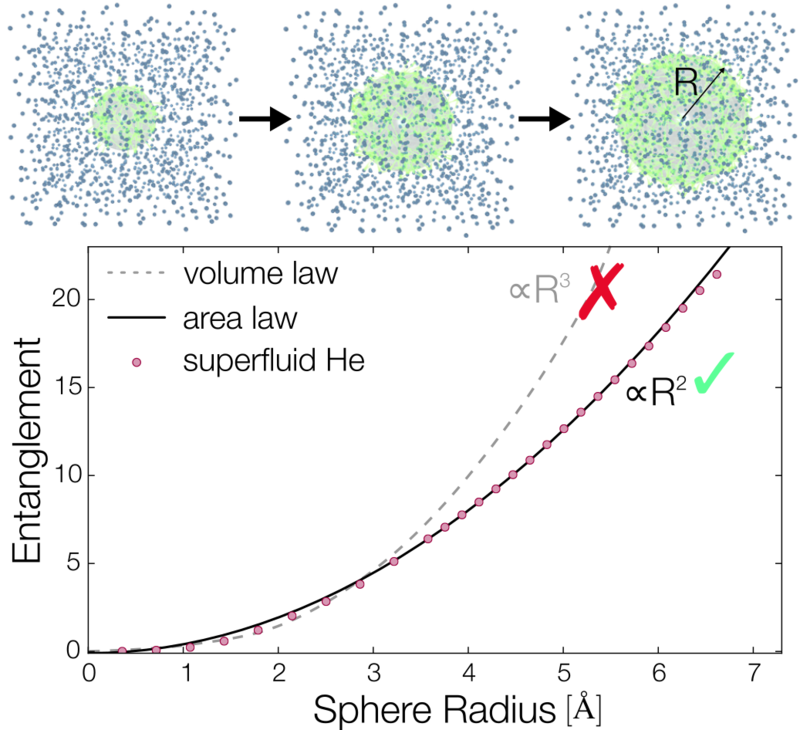 Being able to understand quantum entanglement in complex systems with many particles is very difficult, and finding ways to control it is even harder! 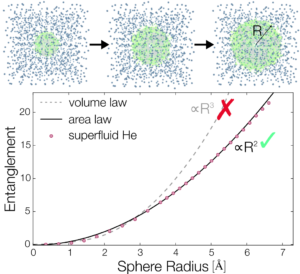 In our research, however, we found that the density of the superfluid helium regulates the amount of entanglement it contains. This suggests that laboratory experiments and, eventually, even quantum computers could manipulate the density of a quantum liquid as a knob for tuning entanglement. Laws like this one relating information and area are starting to form a new foundation for our understanding of modern physics—from a supermassive black hole to a puddle of superfluid helium! To learn more about quantum entanglement, check out the first video below from Physics Girl. 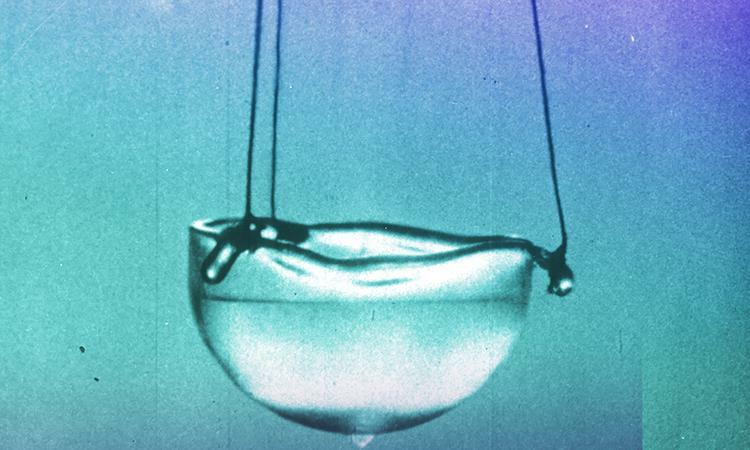 To learn about other peculiar properties of superfluid helium, watch the second video below from BBC, and the videos in Daniel Lathrop’s post “The Turbulent Tangle of Quantum Vortices“! Fig. 2 (Click to enlarge) Entanglement area law in superfluid helium. As the size of the superfluid helium sphere increases (shown at the top of the graph), the entanglement also increases. It increases at the same rate as the sphere's area (based on the square of its radius, and shown here with a green check mark), NOT the same rate as the sphere's volume (based on the cube of its radius, shown here with a red "x").